Another stolen recipe from my mom...we had it with our Christmas Day brunch. Ella LOVED them :-) and next time she wants pancakes I think this is what I'll do...much less time consuming that making a whole batch of actual pancakes! Preheat oven to 425 Degrees. Place butter in a 9 X 13 inch pan. Put in preheating oven until butter is melted. In a blender, combine eggs, milk and pancake mix. Pour batter into baking dish. Bake for a bout 15 - 18 Minutes until pancakes are puffy and lightly browned. Do not open oven while pancakes are cooking. 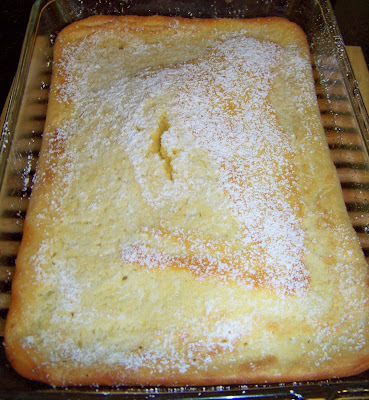 Top with sifted powder sugar. Serve with warm maple syrup or fruit toppings. I'm glad Ella Bella likes them! I made this for breakfast this morning and my kids LOVED it! Finally, an easier way to make pancakes! Cannot wait to try this one out!